Teachers are a professional educator with the main task of educating, teaching, guiding, directing, train, assess, and evaluate students. Beside their status as an educator, teachers are also part of an organization, schools. Relationship between teachers and the principal is the relationship between superiors and subordinates. Teachers also had hierarchy relationship with the institutions. Accordingly, the institutions have a great impact on the school sustainability, but it is represented by the principal. However, in fact, a lot of schools collided with the authoritarian attitude and a one-way communication from the institutions. The main aim of this research is determine the effect of leadership style towards teacher’s assertiveness and to obtain overview on teacher’s assertiveness skills towards their superior. This research uses quantitative methods-non-experimental with ex-post facto comparative-causal research design. The subjects of this research are teachers of 1st to 6th grade on SD-IT X, Cengkareng, West Jakarta. Analysis tools is Sperman test, which was used to analyze the effect of leadership style on teacher’s assertiveness in SD-IT, X, Cengkareng, West Jakarta. 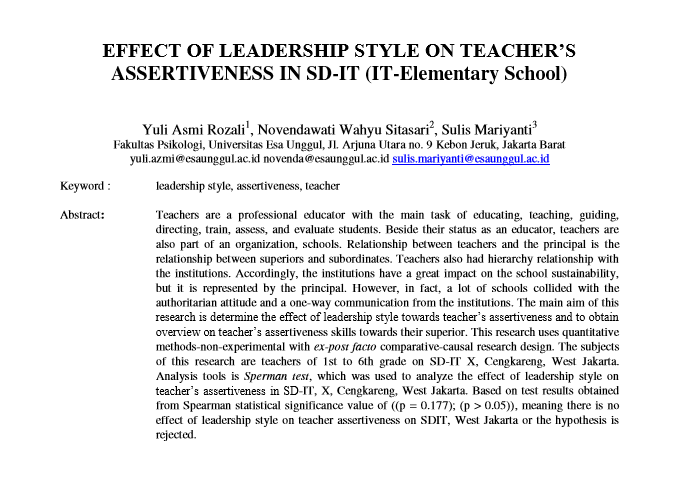 Based on test results obtained from Spearman statistical significance value of ((p = 0.177); (p > 0.05)), meaning there is no effect of leadership style on teacher assertiveness on SDIT, West Jakarta or the hypothesis is rejected.